The Roasting Machine is a Multipurpose machine, used for roasting, reduction of Moisture contents, increasing self-life of products, and aroma enhancement. Normally in Roaster Machine the heating is achieved through the Jacket filled with special purpose heating oil, which is heated through Electrically operated oil immersed heaters. The heating temperature is controlled through digital temperature controller. The heating temperature can be achieved up to 250 Deg. C. For higher batch capacity machines, the heating can be achieved through Steam Boilers, Thermic fluid heaters using low grade coal or other fuels such as Paddy husk, Fire wood, Bagasse, agricultural / Bio waste etc. 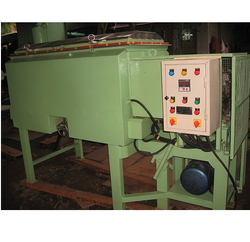 The Gaur Korma Roaster Machine is a multi purpose machine, used for roasting, reduction of moisture contents, increasing self–life of products for various types of Powders, Flours, Seeds, Granules, Pulses, Semi paste, Gravy type products. The roasted Gaur korma is used as rich protein food in animal, cattle and poultry industry, and also as a binding agent in Gum and Adhesive industry. Packaging Details: Standard plastic wrapping or seaworthy wooden cage for export consignment.